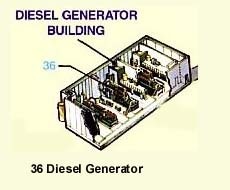 The emergency diesel generator building (graphic) is separate in the case of this plant. In some cases, the diesel generators may be contained within a larger building. Every nuclear power plant has at least 2 diesel generators that provide emergency electrical power in the event that all offsite electrical power is lost. The diesel generators have turbochargers that supply combustion air. To assure that they start, emergency air storage tanks supply high pressure air to turn the diesel. 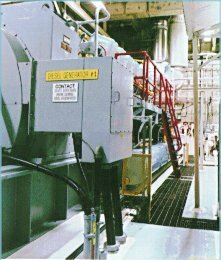 As with most rotating mechanical equipment, water cooling systems and oil lubrication systems are used. The diesel generators are typically tested 1-2 times per month when they are run for about 1-4 hours. Several times per year the diesels may be run for up to 24 hours to ensure that the equipment would function during a loss of offsite power. These generators provide power only when needed to special safety electrical distribution panels (emergency switchgear). These panels in turn supply power to those emergency pumps, valves, fans, etc. that may be required to operate in the event of the postulated catastrophic event - a simultaneous total loss of outside power and a major break in the reactor coolant system.